If you told me a year ago — maybe even a few months ago — that my city would be on the front page of the New York Times, or lead the A-Block on Good Morning America, I would have been ecstatic. Believe it or not, back then was a promising time for Charlotte, North Carolina. The Carolina Panthers and Golden State Warrior Stephen Curry were smashing records en route to championship appearances, and the city was preparing for an economic boom because of the 2017 NBA All-Star Game. College is a place where you form your identity, and the distance away from home (albeit only a two-hour drive) made me realize my identity is intertwined with Charlotte because it’s everything I’ve ever known. Ask me how I feel now. All of those hopeful aspirations for my city collapsed. And instead of blue-and-black confetti caressing a Lombardi trophy as it was paraded through Bank of America Stadium, the smog of tear gas and the barks of protesters replaced it. The narrative for this horrible scene stays the same, the only things changing are the names, the places and the hashtags. No matter where this familiar situation occurs — these controversial killings of people who look like me — emotions will always swirl inside. And they swirled pretty often. Seeing executions on my Facebook feed has become somewhat of a routine for the past two months. My confusion, disbelief and fear didn’t erode when high-profile shootings happened hundreds of miles away. I was just as perplexed when black men — in some cases, black boys — were killed in or near Miami; New York; St. Louis; Cleveland; Baltimore; North Charleston, South Carolina; Milwaukee; Baton Rouge, Louisiana; St. Paul, Minnesota; and Tulsa, Oklahoma (did I forget any?). But now, this venomous snake has slithered into my backyard. It’s irrelevant to me whether Keith Lamont Scott “posed an imminent deadly threat,” as officers say, or was reading a book, as his family claims. There is no escaping the tragedy — it happened and there is no turning back. Charlotte is the next plot on the bloodstained map of mistrust, the biggest thing impacting me as a Queen City native. I drive into uptown every week when I’m home. Sometimes I just sit and look at the skyline when I’m bored. I’ve eaten multiple barbecue chicken pizzas at Brixx on South College Street — one of the main streets shrouded in smoke and crowded by standoffs. In July, I attended a national sports writing conference at the Omni Hotel — the place where a demonstrator was shot and killed by a peer. San Francisco 49er Colin Kaepernick wasn’t exaggerating when he said there were “bodies lying in the street.” I’ve said it before, but this week proved it. At the rate this country is going, I can easily become a hashtag. Now the epicenter of the race-relations debate has invaded my hometown, and I can’t keep silent about it. This is real to me. Throughout this summer, the nation splintered into sides on this issue, but I’ve made a concerted effort to account both arguments. I was raised in a military household and trotted around in my father’s naval uniform for fun as a toddler. I helped prepare my white pastor, who has almost completed his theological doctorate, to deliver a sermon to his 1,000-plus-member congregation on this topic in August. That was powerful to me because he humbly asked for advice from a 19-year-old because he knows I have inherently different perspectives and experiences from him. 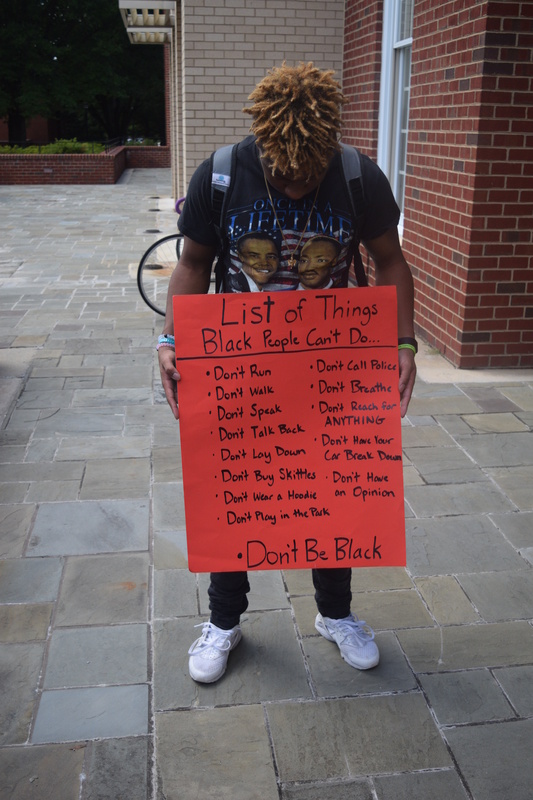 I even broke bread with 20 Charlotte-Mecklenburg police officers and 19 other black teenagers in August and gleaned their mindset. I feel like I’m as balanced as one can possibly be on this national epidemic. The black kid in me instinctively wants to let my frustration control me. After everything that’s happened, how can you blame me? But the logical, journalistic, articulate side of me understands what public servants endure daily and knows the majority of society genuinely doesn’t comprehend my race’s outrage. And in terms of finding a solution, it has become seemingly impossible. People tend to brush the conversation aside because it’s uncomfortable. And when we try to spark peaceful awareness of this issue, we’re demonized, harshly condemned and even our patriotism is questioned. But it’s “forgotten” that we honor certain people with federal holidays, ranging from our forefathers to a prominent 1960s Atlanta preacher, who were once considered rebels. Even this summer, before the nation became polarized, the world joined to enshrine the legacy of a former heavyweight champion, and he essentially broke one of the most severe laws of his era. It’s a Catch-22 in every sense of the phrase. It’s a no-win situation and the only thing I’m left with is a shattered, pummeled psyche. If you add the debacle of the HB2 legislation in North Carolina, my city and state have people and businesses repudiating the once-progressive North State. It’s terrifying on so many levels to watch my city implode on a national stage. Charlotte is never going to be the same again. Every time I tell someone where I’m from, they’ll inevitably ask me about this episode and categorize my city — particularly those in my city who look like me — as something we are not. But that perception is a lie because my biggest mentors, who are mostly black men, are from Charlotte. Aside from our skin color, Charlotte is what binds us, and they have been instrumental in shaping me into the man I am today. They keep me from embodying the stereotype, but people will never know that because my city is forever smudged. Summer officially ended a few weeks ago, but “the invigorating autumn of freedom and equality” hasn’t swept in yet. The eyes of the world are descending on Charlotte to see how we react — and so far, it’s been embarrassing. President Barack Obama recently mentioned my city in the same breath as Ferguson, Missouri, which means the nation has categorized it with the same type of anarchy and mayhem. I wish we were in the headlines for something different, like a Super Bowl victory or All-Star Weekend coverage. But as unfortunate as it is, we have the unique chance to be a trailblazer in enacting change with the eyes of the world upon us. Charlotte will always be the best city in the world to me, regardless of what anyone says. Now it’s time for us to prove it. Emmanuel Morgan is a sophomore at Elon University and a native of Charlotte, North Carolina. He is majoring in print and online journalism and minoring in Spanish. He is the news editor of his school’s newspaper, The Pendulum.